Libertarian's Forum › Libertarian's Forum › Information Board › Yay, we're back. Glad to see the site back. What happened? And BTW, I've been running and developing a number of different forums, and forum software/bbs since the 80s. If you ever need a hand, I'm willing to help you. +Crystallas, who are all the people in the pic you include with every post? The legend is under the picture. This is a message board, and a feature of message boards is using a signature. It's included in every post by default, and you can change this under your UserCP. 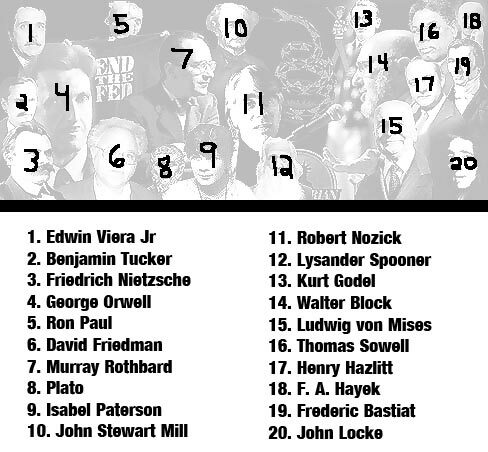 It's a list of influential libertarian and like-minded people. Few were not libertarian-minded, not all were libertarians all of the time, some were later in their lives, others developed philosophies that are ideologically neutral and present accurate concepts that help us better understand the world we live in. There are more than what I have in my list, however, I only add the ones that I have read every book or major work(with journalists and professors, it is impossible to read every work, thus why it is also selective). Not just reading, but liking what they contribute. I could easily add another 200 that qualify, but that would be overkill. The ones here are the best starting points. The idea of having a collage of influences aids in understanding libertarianism. There is quite a bit of objectivity to liberty minded persons, and having somewhere to go for more information is paramount, otherwise you have a bunch of people running around basing definitions on a sheer guess. Perception based meanings, opposed to a meaning based perception. But by far the most libertarian on the picture is Waldo. Waldo don't give a f***. He's at every rally.